I recently read an article in Conde Nast about why it’s OK to visit a place more than once. If you’re interested, you can check it out here:. It’s confirmation for what we’ve experienced over the last month or so, both in the States and in Italy. Greg and I were married in 1986 and we spent our honeymoon driving from Ohio to New England and then to our cottage in Canada. The day after our wedding we drove through Corning, New York and I remember stopping there and enjoying a brief visit to this town I knew only because of CorningWare. I have fond memories of our visit but don’t really remember much...the fact that I was a new bride at the time may have affected my lack of recall. We revisited the Finger Lakes region many times when Chelsea was attending Cornell University and we absolutely loved everything about it. I thought we knew this area pretty well as we did quite a lot of exploration each time we traveled to Ithaca. So, I was really surprised when we returned to Corning, New York recently to attend TBEX, our first travel blogger’s conference. We were introduced to a whole new side of the Finger Lakes due to our experience. We had so much fun at TBEX and in in Corning! We stayed at a darling Bed & Breakfast that we found on Airbnb. Red Rooster Farm was in the countryside with a corn field across the street and chickens in the back yard. Our hosts gave us a lovely respite at the end of each day’s conference activities as well as a delicious breakfast to start each day. The Red Rooster Farm, our B&B during the TBEX Conference. Because of TBEX, we got to do things that I never would have dreamed of doing in this area. For example, we traveled by bus to Watkins Glen International and got to drive around the race track! We were in bus with 48 people – but still….it was pretty cool. It was certainly something I had never done before. We also ate in downtown Corning and had a fantastic meal at Hand & Foot. We are pretty harsh critics when it comes to food and drink and they served up fantastic cocktails and spectacular food. The pickled vegetables were an outstanding and surprising treat. 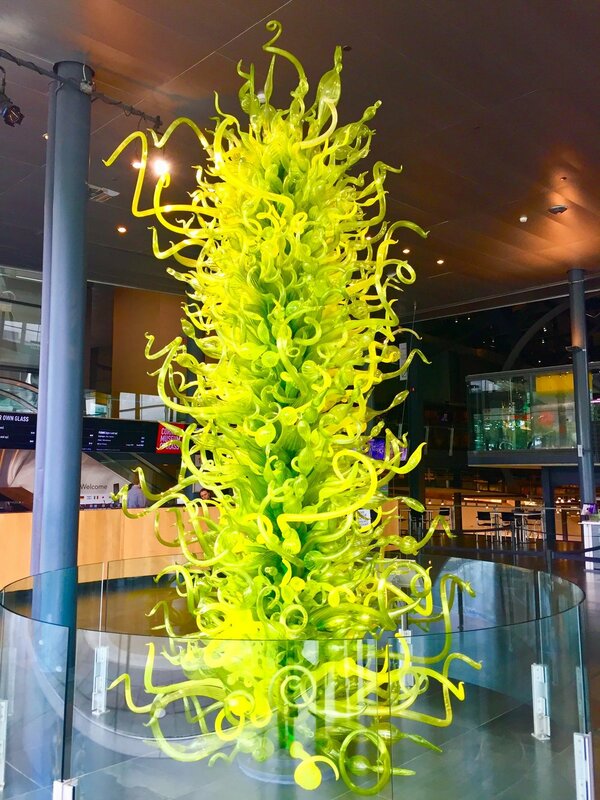 Best of all, the Corning Museum of Glass where the conference was held is REALLY impressive. Who knew what an outstanding museum was right there in the Finger Lakes? I had no idea how innovative, interesting and entertaining this museum would be. I even got to hold a blow torch and make my own glass bead. I learned a lot about glass and its history and importance in this region. It was fantastic! I thought I knew what to expect in Corning and I was completely blown away by what we found. TBEX provided amazing insights, terrific networking opportunities and a location that was truly outstanding. Because of this conference, we are even starting to write for other websites in addition to our own. Chelsea was a guest contributor on Holidays to Europe and Greg will be published in GoNOMAD on October 19!! How cool is that?? I thought I knew what to expect when we returned to the same winery in Piedmont, too, but again, I have had some wonderful surprises. You can read about our time spent a year ago at La Roche in Dogliani here, here, and here. It was our first WWOOFing experience and it really was amazing – but I was tentative about what I did last year while we were here. Now I feel much more confident. I’m doing things I’ve never done before – pulling out baby grape roots to be replanted, trimming and tying roses and learning how to prune the vines. I’m more confident helping out in the kitchen, too. Our host, Ursula, has very specific ideas about how things should be done – and she should! It’s her kitchen and what she does works extremely well! Last year I was timid about doing things because I didn’t want to do it wrong. This year, I know a little better how to do things her way and I am enjoying learning how she lives a sustainable lifestyle with very little waste. Early morning dew on the vines, Dogilani, Piedmont region of Italy. Last year we were surprised that we weren’t the oldest ones here. On our prior experience, the other WWOOFers were closer to our age and they were very international coming from Switzerland, Italy, Germany and the US. This year, we got to pick grapes with two of our fellow WWOOFers from last year – from Switzerland and Italy – but they have both returned to their homes and we are now the oldish geezers. We are joined by a courageous and driven young woman from Israel and 2 young Americans who recently graduated from the Culinary Institute of America (CIA). They have been hired by some of the finest restaurants in New York City, Eleven Madison Park and Blue Hill. Before starting off on their new careers, they decided to learn more about wine by WWOOFing in Italy and they found La Roche. So, it’s really fun talking with these young people and spending time with them, learning about and encouraging their dreams – but it’s all in English this year and mostly conversations are about pop culture and American ideas……we’re not learning as much about the culture we are living in. But we are loving sharing what we know about this amazing place. We also love talking about food, the American restaurant scene and experiences on wineries in Israel as well as classes at the CIA. Before the Americans came here, Ursula asked if Greg and I wanted to cook a venison leg for dinner one night. We were happy and excited to do that and glad she trusted us in her kitchen! But when the CIA grads arrived, it was very easy to turn that task over to our new friends with much more culinary background than we have. It was a great decision as we had an amazing meal that night! Greg and I had spent that day hiking from hill town to hill town, enjoying wine and walking through the vines. We hiked over 10 miles the day they cooked dinner. We started in Castiglione Falletto and hiked to Serralunga, then Montforte, and on to the winery near Dogliani. When we returned, the chefs were in the kitchen cooking up a true feast. They had been to the market in Alba earlier in the day but the only thing they bought that was used for the meal was some beautiful chanterelles. Too bad we weren’t able to pick some for them like we are able to do in Canada! Everything else came from right here on the winery. Ursula has an amazing garden and fresh produce growing here on the winery. She also buys locally and stores what she wants to use later in remarkable ways. Absolutely nothing is wasted. Our chefs, Jonah and Nieko, found everything they needed right here for their banquet. The leg of venison was accompanied by roasted vegetables of every variety and the sauce they made for the meat was spectacular. They also made our friend Idon (the WWOOFer from Israel) a vegetarian dish out of squash from the garden. They placed roasted veggies mixed with mascarpone cheese to add richness right in the bowl of the squash. Incredible. With Marcello’s wine from 1993, their first vintage here at La Roche, it was a feast among friends, indeed. We’ve also enjoyed showing Idon, Nieko and Jonah around the Barolo region. They are all interested in wine, or they wouldn’t be here. Nieko and Jonah plan to take the level 2 Master Sommelier exam and Idon strives to be a female wine producer in Israel one day. Greg and I have taken it upon ourselves to share as much as we can about the Barolo region with them to further their wine knowledge – and ours (it’s not exactly a difficult task!). That involves some touring and tasting. Marcello and Ursuala have kindly shared their car with us on the weekends so we can go and do more in the area and it has been a blast! Last weekend we took the young WWOOFers (as we are the old WWOOFers – and Greg is the “Chief WWOOFer”) to 4 of the 5 Barolo region hill towns to give them a good start on their orientation to the area. We feel like it’s important to their wine education – and ours! And this year we are getting to do more in the vines, which is also new. Lest you think that it is all romantic living on a winery and toasting to the harvest, I am here to tell you that this is often very hard work. Truly. Picking grapes is exhausting – but once harvest is over, the annual cycle that brings new grapes the next year begins. We learned how to prune the vines – and then we tore out vines from a vineyard that will be replanted one day. Pulling out the baby root vines from the ground was tough! We prune prickly rose bushes and cut rebar and pull wild vines and weeds away from root stock. It is sometimes rigorous, grimy work. A shower at the end of the day feels amazing. It was often hot grimy work last year too, but getting to do more in the vines makes this a new experience for us. We love learning more about the wine making process and the farming that goes into growing the grapes that makes the wine what it is. This experience gives us fresh perspective for each glass of wine we enjoy. So, we have returned to places we’ve been before, and deepened our appreciation each time. There are so many places we still want to travel, but coming back has its pearls of wisdom and joy too. We are truly enjoying this journey. We absolutely love Piemonte, Italy, where we are right now. If you would like to visit this amazing food and wine region, why don’t you join us here in October 2019? The first week of our Small Group Trip to Piedmont is sold out but there is still room in week two. There is also room for Tuscany in May 2019, but there are only 5 spots left. Check out both itineraries here. Want to travel someplace on your own but want some help? We can do that too. Find out about all our travel services here. Let us help you make your travel dreams come true. Sign up with your email address to subsribe to the blog.